Lesbian Gay Bisexual Trans History Month takes place every year in February. It celebrates the lives and achievements of the LGBT* community. We are committed to educate, celebrate and promote its diversity and that of society as a whole. LGBT History Month is an opportunity for all of us to learn more about the histories of lesbian, gay, bisexual and transgender* people in the UK. In the past, LGBT people often remained hidden due to legislation. Even though we applaud the changing legal and social climate, many still live in fear of ostracism, prejudice, victimisation, assault, and even murder. Education and awareness can change this. LGBT History Month marks a month-long annual observance of lesbian, gay, bisexual and transgender history, and the associated history of LGBT* rights movements and legal milestones. It is observed during October in the United States, to include National Coming Out Day on October 11. Here, in the United Kingdom, it is observed during February to coincide with the 2005 abolition of Section 28, which until then prevented schools from promoting LGBT issues in education. 2017 saw the 50th anniversary of the partial decriminalisation of Homosexuality via the Sexual Offences Act (1967). 2018 marks the 30th anniversary of Section 28 (1988) and the 10th anniversary of Norwich Pride. The theme for LGBT History Month 2018 is Geography: Mapping the World. Local speakers are available to speak on this theme around such explorations as Historical gender identity around the world, Progress & Regress of LGBTI+ Rights, Labels & Language outside of Western LGBT Culture, and GRA 2.0 - a clash of Rights? Poets and performers are also available. 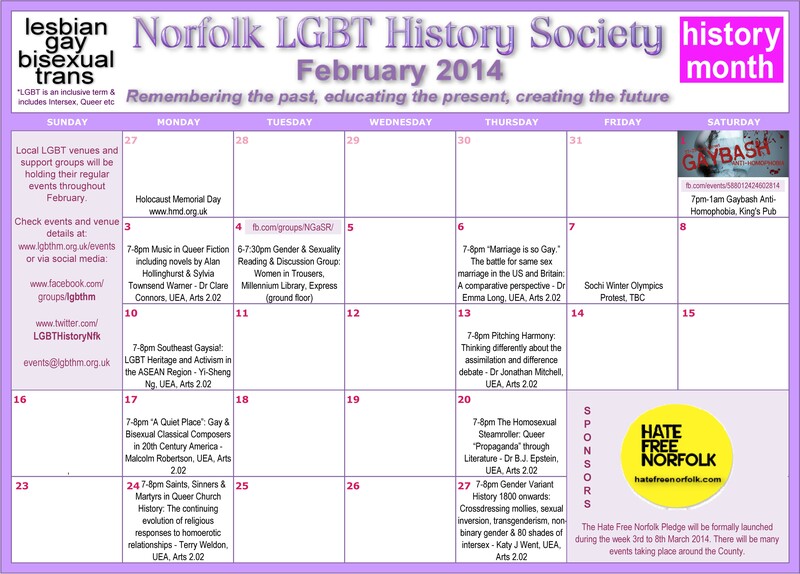 The UEA also has an excellent record of putting on LGBT History Month events. Contact LGBT History Month's event coordinator for further details. LGBT History Month in Norfolk has been going since 2008 and has been supported by councils, unions, community groups, local businesses and generous individuals. It is coordinated by the Norfolk LGBT History Society. LGBT Events in Norfolk throughout the year. *LGBT+ is an inclusive term representing Lesbian, Gay, Bisexual and Trans(gender).